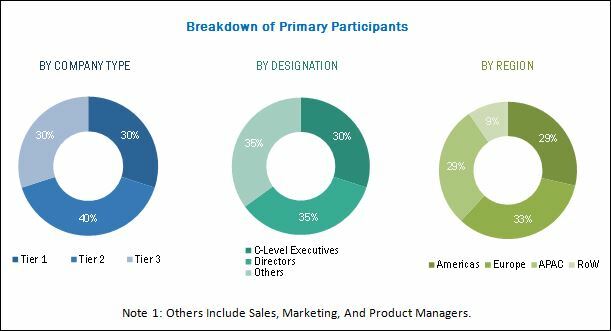 [137 Pages Report] The building management system market was valued at USD 6.65 billion in 2016 and is expected to reach USD 19.25 billion by 2023, at a CAGR of 16.71% between 2017 and 2023. Governments across the globe have taken due cognizance of the benefits of effective management of the buildings and their potential savings. They have been incremental in bringing forward various legislations and initiatives to drive the development and adoption of building management system (BMS) technologies. For the study, the base year considered is 2016, and the forecast provided is between 2017 and 2023. Traditionally, operating cost was one of the major concerns for building owners as they had to incur huge expense in the maintenance of the building because of lack of advanced technology. A simple business consideration for using BMS is being more energy-efficient. As reducing energy consumption directly transcends into reduced energy spending, power saving helps improve the business profitability. Ensuring the BMS operating in peak energy demand conditions will enable to improve system efficiency and reduce operating costs. Effectively designed and managed BMS enable abundant opportunities for improvements in energy efficiency by enabling building operators and managers in providing an optimal working environment consistent with maintaining a building’s energy efficiency rating; enabling early identification of equipment failure; identifying unusual patterns of energy usage; monitoring the effectiveness of energy management plans; and so on. Availability of a complete set of information about building enables the building manager to rectify issues through consultation or engineering solutions. Similarly, it also extends the operational life of equipment and systems in the building through reducing loads and operating hours, which results in the reduced maintenance and capital costs with less consumption of embedded energy through equipment replacement and upgrades. Building automation can help automate the HVAC and lighting systems, saving 5–30% of the overall energy consumption of the building. The commercial deployments such as data centers consume 25–50 times as much power as an average office and spend 40–50% of all power to run the HVAC and other cooling systems. These large numbers for energy spending indicate more opportunities for energy efficiency and higher savings using BMS. Additional cost saving from preventive maintenance also adds to the benefit of the building manager. The average payback period for return on investment (ROI) from an initiative of the BMS-integrated systems is 3–8 years. The sizing of the building management system market has been done by the top-down and bottom-up approaches. The bottom-up approach has been employed to arrive at the overall size of the building management system market from the revenues of key players (companies) and their share in the market. Calculations based on the number of different building management systems that are installed in different premises and the demand from all major countries is further added, and finally the volume is multiplied by the average selling price of each building management system subscription/license to arrive the overall market size. In the top-down approach, the overall market size has been used to estimate the size of the individual markets (mentioned in the market segmentation), through percentage splits from secondary and primary researches. For the calculation of specific market segments, the most appropriate parent market size has been used to implement the top-down approach. Note 1: Others include sales, marketing, and product managers. The building management system ecosystem comprises major players such as Honeywell International Inc. (US), Siemens AG (Germany), Johnson Controls International PLC (Ireland), Schneider Electric SE (France), United Technologies Corp. (US), IBM Corporation (US), Ingersoll-Rand Plc (Ireland), and Delta Controls (Canada). All these companies have their own R&D facilities and extensive sales offices and distribution channels. The products of these companies can be used across various industries for respective applications. The report provides the competitive landscape of the key players, which indicates their growth strategies in the building management system market. In April 2018, Johnson Controls acquired the assets of Triatek, a leading manufacturer of innovative airflow solutions for critical environments across the globe. In March 2018, Schneider Electric and AVEVA created a joint venture to form a global leader in engineering and industrial software with scale and relevance in key markets as well as an unmatched set of solutions covering all aspects of digital asset management from process simulation to design, construction and manufacturing operations management and optimization. 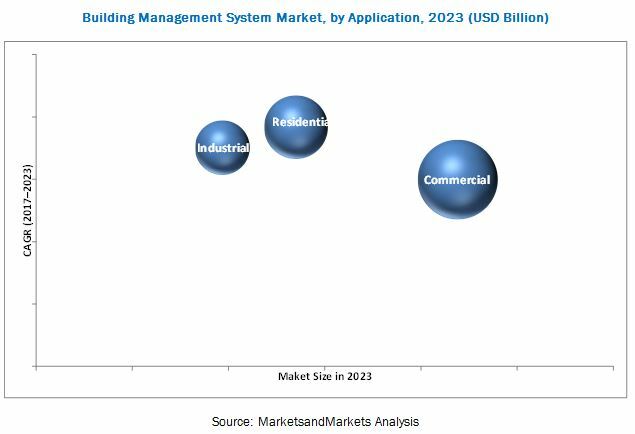 The building management system (BMS) market was valued at USD 6.65 billion in 2016 and is expected to reach USD 19.25 billion by 2023, at a CAGR of 16.71% between 2017 and 2023. The major factors that drive the market for building management systems are significant cost benefits to industrial, commercial, and residential users, simplified building operations and maintenance, increasing demand for energy-efficient and eco-friendly buildings, and growing integration of IoT. The growing integration of IoT with building automation systems (BASs) is also driving the growth of the building management market based on software. The smart devices that are integrated for the purpose of building automation and management are expected to be more self-governing and intelligent in terms of sharing data with BASs and with the cloud. The building management market based on software has been further divided into facility management, security management, energy management, emergency management, and infrastructure management software. The market for the energy management software is expected to grow at the highest CAGR during the forecast period. Buildings are the largest consumers of electricity globally. With the increase in the global economy and enhancing the standard of living, the consumption of energy resources is increasing, which, in turn, increases the demand for building energy management systems. The building management system market has been segmented on the basis region into the Americas, Europe, APAC, and RoW. Europe is expected to hold the largest share of the total building management system market in 2016. The region has been an early adopter of the BMS, which has boosted the demand for BMSs in this region, leading to a higher share in the market. Some of the major players in the market such as Johnson Controls International PLC (Ireland), Schneider Electric (France), Legrand (France), Ingersoll-Rand Plc (Ireland), Robert Bosch GmbH (Germany), and ABB (Switzerland) are based in this region. The presence of a large number of players in the region is serving as a factor driving the building management system market. The building management system market has been segmented on the basis of application into commercial, residential, and industrial. The commercial application holds a major share of the overall building automation system market as the demand for energy conservation and reduction of the overall operational cost is the highest in this vertical. Various building regulations and policy frameworks mandate the commercial entities to limit the energy consumption and carbon emission driving the demand for building management systems in the commercial application. With the advent of Internet of Things (IoT) and smart connected homes, there is a surge in the management of the residential premises. Large residential complexes have been frontrunners in adopting the building management systems. Building management systems ease management of various resources in the building and enable intelligent management of infrastructure facilities such as parking premises, water management areas, and waste management areas. Installation of the building management systems also enables improved safety and security to the building managers along with the overall energy savings. Commercial building segment includes office buildings, retail and public assembly buildings, educational institutes, hospitals and healthcare facilities, airport and railways, others which include nonmanufacturing commercial buildings. Office buildings are among the prominent end users of the building management systems in the commercial sector. Building management in office buildings mainly includes HVAC control systems, lighting control systems, and security and access control systems. These are also the sources of high power consumption, and managing these sources helps in cutting down the critical operational expenditures. Industrial facilities include factories, production plants, distribution facilities, warehouses, and other infrastructure buildings which support manufacturing and production functions. The segment is expected to adopt smart building solutions to attain energy and cost savings, higher productivity, enhanced identity and access management, and optimized surveillance. Manufacturing and industrial buildings have their own set of requirements for different manufacturing processes and storage purposes. They are equipped with the solutions based on highly sophisticated technology ranging from air-conditioning units to controlled ventilation and smart lighting systems, which contributes highly to the overall energy consumption. Reducing energy expenditures is very critical for industrial and manufacturing facilities as they directly contribute to the operational and capital expenditures of the company, and can affect the profitability. This has driven the demand for the management systems to manage and curb down the expenditures effectively. What are the opportunities for the various players present now and planning to enter at various stages of the value chain? Honeywell International (US), Siemens (Germany), and Johnson Controls International (Ireland) have been aggressive partnering with building automation system hardware offering start-ups, how will this impact the growth rate of the BMS market and who will have the un-due advantage? Lack of technically skilled workers and high initial implementation costs pose a restraining block in the building management system market. The deployment of BMSs requires certain conditions and technical requirements to be met, and these conditions could be internal, operational, or external such as understanding of computer software, networking, and applications; designing; and testing the system. Maintenance and servicing require trained and skilled personnel to ensure that BASs run smoothly and have a longer lifespan. In the absence of these conditions, the implementation of building management solutions and services become difficult. The key players in the building management system market are Honeywell International Inc. (US), Siemens AG (Germany), Johnson Controls International PLC (Ireland), Schneider Electric SE (France), United Technologies Corp. (US), IBM Corporation (US), Ingersoll-Rand Plc (Ireland), and Delta Controls (Canada).